Wood sculpture, like stone sculpute is a subtractive process. You “take away” to reveal the form within. It is arduous and demanding and combines both artistic inspiration and physical perspiration. It is yielding but not forgiving it does not allow for mistakes. But wood is organic, warm and “alive” and creates a “one of a kind” unique piece of art that traces it’s beginnings back to the living tree blown by the wind and fed by the sun and waters of the earth. Today, more than ever, we need to “reverence the natural world.” My wood sculpture is, “the water that quenches that thirst.” It is the touching and being touched by the spirit of the earth. Armstong’s work can be found in galleries thought the west-Apen, Vail, Tao’s, Santa Fe, Jacksonhole, Park City, Sadona etc.. In churches, most notably the 16 ft high cathedral doors of St. Mary’s in Boise, ID and resorts thought Central Oregon. 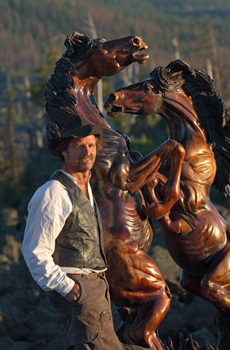 In sisters his work can be seen at the High Desert Gallery. Special projects are always welcome. Some of his most notable collectors include Burt Reynolds, Clint Eastwood, Olivia Newton John, Nic Nolte, President Bush, Michael Jackson, T.Boone Picken Hardold Coursen.